Bluegrass fans, Thursday evening, June 28th at 7 pm is just for you! 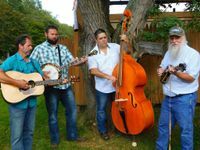 Sawmill Ridge is a band that infuses itself with a traditional rich sound which comes from the love of bluegrass. Leading the group is Terry Dennison ( aka Sweet T ) with a sound that originates from playing music since he was young and listening to the likes of Ronnie Bowman, Lester, Skaggs, Del Doyle and many more. Helping fill the middle is Dwight Wright ( Baby Face ) providing that steady chop and them fancy licks on the mandolin, if he is not playing a mandolin he is building one, Dwight also provides vocals that help set the bass line. Followed by Tyler Ashcraft ( Smiley ) on the banjo, Tyler puts the D in drive and the B in Bluegrass, better have your picks on tight when he kicks it, he loves the old timey tunes along with the big band sounds. Rounding out the group Mr. Jerry Murnahan ( Pork Chop ) helping give Sawmill Ridge the heartbeat that completes a traditional, fun for the whole family, bring your dance shoes!